It's been a while since I've been able to produce content for the WSGF - but i'm back!!! I recently decided to upgrade my DellU2311H panels to Acer XB270HU. These are 1440p 120/144Hz IPS panels, which feature NVIDIA G-SYNC. Not long after upgrading, I realized that I had put myself in a pickle. My previous GTX 780 SLI cards only had one DP connection each. To run at full 2560x1440 resolution AND use the 120/144Hz refresh rate - each panel needs its own DisplayPort connection (Dual-Link DVI doesn't have enough bandwidth). So, I needed new cards that totaled more than three DP connections. 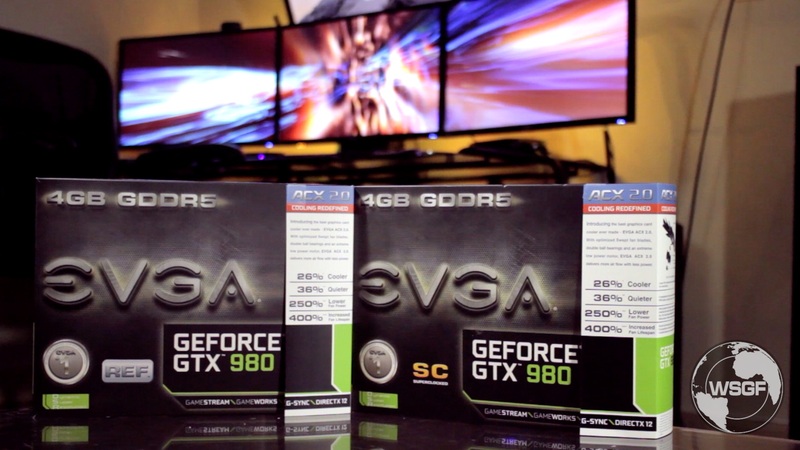 Luckily the fine folks over at EVGA were nice enough to provide a second GTX 980 for this rig. Many, many thanks to Jacob Freeman and EVGA. Without their generosity, we wouldn't have been able to get this rig properly setup and begin exploring this cutting edge configuration. Thanks again to Jacob for his help, and EVGA for their support. First, let's look at some of the key points (pros and cons) I settled on in my decision making process, when deciding between a triple-wide and an ultra-wide setup. (Note: I have not extensively tested an Ultra-wide setup beyond 20-30mins of personal use. I do have knowledge based on other video reviews and WSGF members opinions). As you can see there are pros and cons to both setups. I expect there to be a 34" or higher Ultra-wide panel that is capable of running GSYNC, 120/144hz, and IPS at some point so some of the cons listed are only temporary. 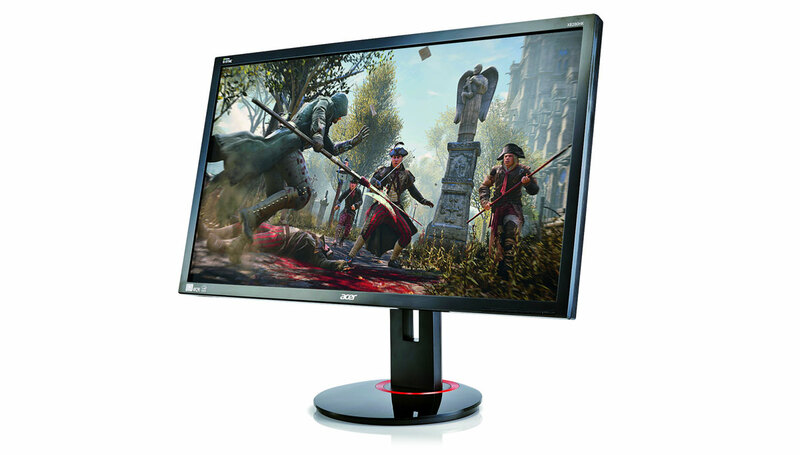 Acer and Acer have announced curved ultra-wide IPS models with FreeSync and/or G-SYNC, which will be released in the second half of 2015, but these only go to 75Hz. That being said I still prefer the triple wide setup to the ultra wide for a variety of reasons. I stated this in the video review and I'll say it here: It's near impossible to run any current game at a triple wide resolution at 7860x1440 at anything past 30fps. You could snag an extra card for triple SLI, or bump up to 980TI's for extra performance - but I'd still fully expect that pushing 60fps would be a difficult task. This indicates that getting a 1440p 120hz/144hz capable monitor for multi-monitor gaming won't pay any dividends today. So what's the good news? You're future-proofing yourself. Monitors are an investment, and not often upgraded or replaced. There's no reason to not get 120/144Hz capable monitor today, when you'll be able to use those features soon enough. Also, I'm greedy and want all the best options right now. But unfortunately as I've learned you can't always get everything you want (at least not right now). But you can get the next best thing, choice. I remember playing DOTA2 on a single screen (it doesn't support Surround/Eyefinity) and thinking, "Gosh I wish I had a bigger, more powerful center screen". I then realized that having a 120hz center monitor would be very useful for games that only support 16:9. Now is a great time to upgrade monitors, or explore new options. There are tons of different configurations you can choose from, with new technology emerging that will help future-proof you for years to come. The perfect setup is often a mix of available options today, features for future use, and budget. And, in all cases YMMV on which features are most import to each user. But, I'm glad I took the plunge into: 3x 1440p IPS 120/140Hz G-SYNC (man that's a lot of features packed in there). It gives me the best of both worlds - fast response single screen, and immersive gaming (at 1080p or 1440p) for games that don't need a super-fast refresh. I'm looking forward to putting more time in on this rig, and sharing more benchmarks and performance info in the future.